Book Review: "Ready, Set, Find Easter" and GIVEAWAY!!!! Get ready to follow Jesus as He enters Jerusalem, shares the Last Supper with His friends, and walks in the garden of Gethsemane. 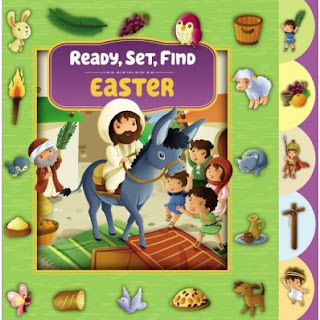 This holiday board book is perfect for young children who will love finding the 48 objects hidden on the pages while reading the classic story of Easter, accurately retold and with scripture references. On your mark, Ready-Set-Find! Thanks Zondervan for sending me this book for free in exchange for an honest review. I was not paid for this and all opinions expressed are 100% mine. My five and nine year old don't care that this is a board book because it is a search and find book. We all love to look for all the items on each page with care but also in a race. We are also excited for Easter to be coming so it was exciting to review the scriptures and the Easter story through each page turn. This book would make a great addition to any Easter basket! We always like to add things that will be better then candy and chocolate! Use the easy rafflecopter form below to enter! Some lucky boy or girl would love this prize in their Easter basket! i cannot wait to have the first easter egg hunt with my nephew! this is his first easter! Our favorite Easter tradition is to color easter eggs. We then use the eggs to make deviled eggs for Easter dinner.